Simpson bay beach Cocos condo for rent, ocean front luxury three bedroom condo situated right on the beach. This condo is located in the famous Simpson Bay Beach, close to everything, but far enough away from hustle and bustle! Rent with confidence! Simpson Bay Beach - Stunning newer condo on the beach! Rent with confidence as this condo has just been professionally decorated by a leading designer on the island! This stunning 3 bedroom - 3 bath beautiful St Maarten condo for rent awaits you! This condo has every amenity for a comfortable stay: including central air, satellite TV, wireless internet and maid service available to you upon request. You will also be pleased as The Coco Beach complex also has a large swimming pool which is shared by all residents. Private, gated and secure parking is assigned for this condo. Your Caribbean vacation begins on one of the prettiest unspoiled beaches on all of St. Maarten / St. Martin. A quiet beach with calm waters, lined with sea grapes and palms... and no one to interrupt the peace and tranquility. Some 3 miles of sugary white sand beach await you, literally out your back door! 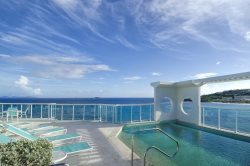 This Coco Condo (Unit 16), is situated on the southern end of Simpson Bay Beach, within the beachfront complex of Coco Beach Club. This intimate, small Beach Club consists of some 15 units in 2-story buildings. All units face the beach and offer mesmerizing views of the Caribbean sea. This pure sand beach is pristine; there is no "ledge" as you enter the sea. Peak Season: $3000. / $3700. Low Season: $2400. / $3000.